Wow what a week people! By the end of this post, you will have access to nearly 120 toys via this week’s 5 Gift Guides. 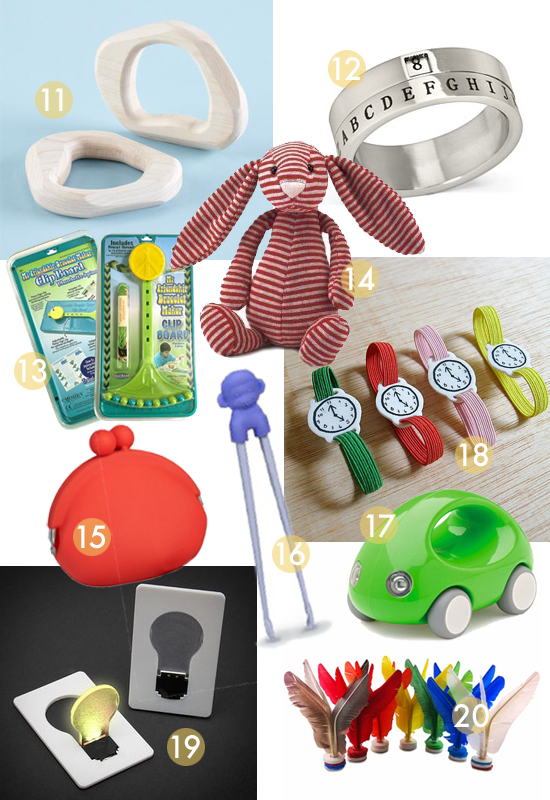 Today we’re going to look at some of my favorite gifts: stocking stuffers. It’s amazing the quirky little things you can find to fill a stocking. You’ll also find many of these gifts in the BRAND NEW handy-dandy SHOP! See that tab at the top of the page? Or click here to SHOP! 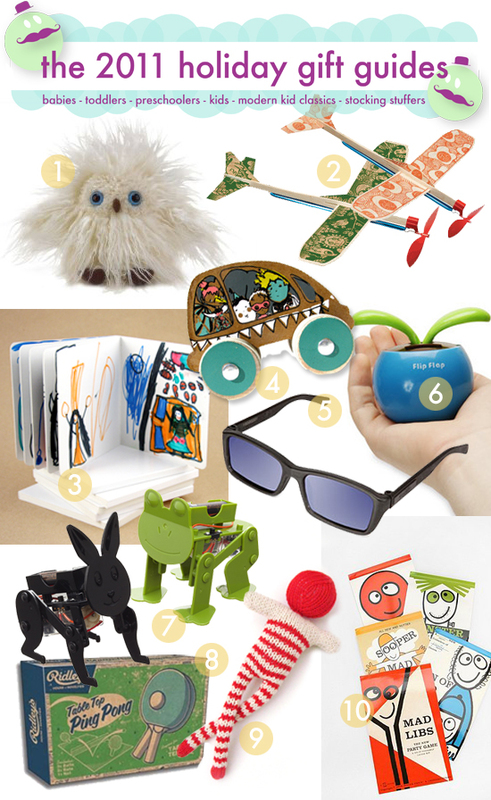 the toddlers gift guide. The SHOP! will be growing all week long! 1. Olive Owl, $17.49 – I have an extra soft spot for this snowy little owl, because she’s inspired by one of my own toy designs. Wouldn’t she be perfect sticking out of your stocking? 2. Artful Flyers, $8.95 – Now this is my kind of balsa plane kit – rubber band propeller power and awesome graphics. Three styles to choose from! 3. Blank board books, $3.50 – $8.00 – Encourage that arty smarty side and give your kids the means to make their own books. Or, you could make a special book from you to your kiddos as well! 4. Fidoodle Limited Edition Printed Circus Car, $14 – Sturdy cardboard (no, I mean it) and adorable graphics make this a great car to add to your collection. There are also blank car kits from Fidoodle as well – design your own! 5. Rear View Spy Sunglasses, $12.99 – Because seeing behind you at all times is such a very cool superpower. 6. Flip Flop Solar Plant, $5.99 – Her little green leaves gently move up and down whenever exposed to sunlight, sit her on a window ledge and you’ve got the ultimate first plant. 7. Build-Your-Own Racing Rabbit or Fast Frog Kit, $14.99 each – 17 pieces and a screwdriver will let your DIYer get going right away,then take them to the races! 8. Ridley’s Table Top Ping Pong, $16.50 – This just sounds like the perfect thing to do on a Christmas break afternoon. Until someone breaks the chandelier anyway. 9. Red Striped Knitted Doll, $18 – A simple baby-safe doll,handmade with lots of love. Those legs look just about right for clutching baby fists. 10. Mad Libs Retro Set, $15.99 – This set of 5 Mad Libs books could make your holiday travel plans a smidgeon easier? The retro covers are, of course, tres cool. 11. Set of 2 Natural Wooden Teethers, $19.95 – What a beautiful, organic shape these teethers have! All the better to soothe achey gums. 13. Friendship Bracelet Maker Clipboard, $12.99 – If the Loopdedoo(#11 in the Kids Gift Guide!) is too much for you, this is a great way to get started. 14. Jellycat Bon Bon Bunny, $17.95 – How can anyone resist such a sweet little stripey face? Perfectly coordinated with Christmas colors, but I’m sure she’ll look just fine in July too. 15. Pochi Silicone Coin Purse, $9.95 – Such a beautiful modern vessel for your kiddo’s hard earned cash. Or marbles. Or rocks. Or snacks? 16. Chimpsticks Chopsticks, $7.00 – Easy peasy chopsticks with a bonus Monkey to talk to while you’re eating! 17. Kid O Go Car, $11.99 – A simple handle, a bright color, and four wheels is really all you need for the perfect little vehicular device. 18. Toy Watchband, $18 – Such a sweet piece of jewelry, whether you can tell time or not, it will make you and your kids smile just a little. 19. Credit Card lightbulb, $4.99 – This is such a fascinating little thing, a light that pops up to turn on, self-contained, and slim enough to fit anywhere. 20.Kikbo Kick Shuttlecock, $6.99 – The newest way to stand around and play hackysack. The simplicity of the toy allows for lots of kicks, tricks, and spins by the kids. I’m itching to try it out!